Have you ever noticed a cookie in Chrome Developer Tools showing a Expires / Max-Age value of 1969-12-31T23:59:59.000Z? Such a cookie is known as a browser session cookie it will persist for as long as the browser is open. SameSite cookies are a great technique for mitigating Cross Site Request Forgery attacks. The only downside is that not all browsers support them yet (ahem... looking at you IE). After many hours in development and testing we are proud to announce the release of FuseGuard 3! FuseGuard 3 ships with 11 new filters, 1 new logger and several additional improvements to better protect your CFML applications. Starting with Java 1.8.0_151 and 1.8.0_152 there is a new somewhat easier way to enable the unlimited strength jurisdiction policy for the JVM. Without enabling this you cannot use AES-256 for example. First download the JRE, I like to use the server-jre for servers. With the General Availability release of Java 9 scheduled for today, I thought it would be appropriate to go over the new features that pertain to security. Back from another great dev.Objective() conference in Minneapollis. This year Foundeo was a sponsor, and I spoke on Securing Legacy CFML Code. Find the slides here. I'm pleased to announce a feature of HackMyCF that I've been excited about for a while: SSL / TLS Scanning. If you stay up to date with security news you know that there have been a large number of vulnerabilities or weaknesses discovered in SSL or TLS protocols and implementations. Here is an interesting vulnerability that I have come across several times in real CFML code during code reviews, I have spoken about it at conferences but have never written about it. Since it doesn't really have a name, I call it Scope Injection, you'll see why in a minute. Those familiar with RedHat Enterprise Linux (RHEL) or CentOS servers may notice that when you update a Apache (or most any other package) on a RedHat / CentOS based server it still reports the same version number. I'm pleased to announce the availability of FuseGuard (Web App Firewall For CFML) version 2.4 today! In addition Ortus Solutions (Luis Majano and the folks behind ColdBox) have also announced Ortus FuseGuard Module - a ColdBox module for FuseGuard. HackMyCF, my company's ColdFusion (and Railo too) server security scanner was recently updated with some cool new features for our paid subscribers. One of the issues that our HackMyCF ColdFusion Server Scanner checks for is the existence of public .git/ or .svn/ directories. Exposing these directories to the public could lead to information disclosure, such as your server side source code. Today with the release of Mozilla Firefox Aurora 23, support for Content Security Policy or CSP using the unprefixed, W3C standard header Content-Security-Policy has landed. Firefox has had experimental support for CSP since FireFox 4, using the header X-Content-Security-Policy. Here are the slides to my cf.Objective() 2013 presentation Writing Secure CFML, thanks to those who attended. Please stop by the Foundeo Inc. booth and say hi, if you are at the conference. This week I helped out a client resolve an issue due to a change in behavior from CF9 to CF10. CF10 automatically adds the secure flag to cookies when the request is over a secure HTTPS channel. For the past two-three months ColdFusion has been increasingly targeted by attackers, as many have found out the hard way. Because my company Foundeo Inc. I often find myself explaining how the session fixation security hotfix (APSB11-04) might cause session loss under certain circumstances, so I figured it was time for a blog entry explaining it. I received a question today about the postParameterLimit that was added to ColdFusion 8,9 by security hotfix APSB12-06 and exists in ColdFusion 10 by default (it is also configurable in the CF10 administrator). I've given a couple presentations now on the security enhancements in ColdFusion 10. The most recent was today at the Adobe ColdFusion Developer 2012, but I've also given it two other times for a Carahsoft webinar, and for the Carahsoft ColdFusion 10 Preview event in Washington DC. Adobe this week released a security hotfix for the HashDos vulnerability for ColdFusion versions 8.0 through 9.0.1. Today I was setting up a new secure ColdFusion instance for a client, and I though I'd document the steps needed to go from ColdFusion 9.0 to ColdFusion 9.0. Earlier this week at the 28C3 security conference in Berlin researchers presented on a denial of service (DOS) technique that several web application platforms (PHP, ASP.NET, Node.js, Tomcat, Java's HashMap/Hashtable etc) are vulnerable to, known as hashdos. Adobe released a security hotfix APSB11-29 for ColdFusion 8 and 9 on Tuesday, which fixes two XSS (Cross Site Scripting) vulnerabilities (CVE-2011-2463 and CVE-2011-4368). One vulnerability exists in cfform and the other in RDS. Adobe has asked me to do an online e-seminar: Protecting ColdFusion Applications with FuseGuard thursday November 3rd at 10am PT / 1pm ET. If you're curious about FuseGuard and how it works please head over to Adobe.com and register now! It's not always obvious which Cumulative hotfixes are installed on a ColdFusion server. I'm pleased to announce that the paid subscriptions for HackMyCF now let you know which cumulative (non security) hotfixes you have installed, and which ones you don't. A few months back I was researching two/multi factor authentication solutions to employ to meet PCI compliance, I came across a somewhat new company called DuoSecurity. It has recently come to my attention that there are some hard coded references to /CFIDE/scripts/ in some of the JS files that are used by the new (in CF9) tags CFFileUpload and CFMediaPlayer. What a great conference cf.Objective() was this year! The quality of presentations was really good and I think that is due both to the speakers and the content advisory board led by Bob Silverberg and including Barney Boisvert, Dan Wilson, Emily Christiansen, Jason Dean, Kurt Wiersma, Marc Esher. Why do you suggest using 3 partitions when installing ColdFusion? One of the nice side effects to installing the latest ColdFusion security hotfix is that ColdFusion 8 and ColdFusion 9 now both include the jar files for the OWASP ESAPI or Enterprise Security API. Adobe has received a few issues with the Security Hot fix released on February 8, 2011. As mentioned last week, a pretty serious Denial Of Service vulnerability in the Java Virtual Machine was disclosed. 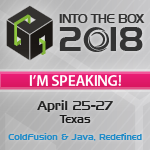 It is important that you look into resolving this issue if you run any java based server side applications (including ColdFusion). Yesterday Oracle released Java 1.6. Oracle has just released a patch for a critical denial of service vulnerability (CVE-2010-4476) in the Java Runtime. I have confirmed that this is easily exploited on a ColdFusion server running an unpatched JVM. It's very very probable that you have code that could be exploited. Now Checks for an exposed WEB-INF directory - The content in the WEB-INF folder should not be served up to the public. If it is under the web root, it must be blocked by the web server. One of the things that the HackMyCF ColdFusion server security scanner looks for, is if the /CFIDE/scripts/ folder is in it's default location. There have been security vulnerabilities located in this folder in the past, most notably was the FCKEditor Vulnerability in ColdFusion 8. Hopefully you are now aware of the service I created in October 2009 called HackMyCF, it's been used to help secure over 3000 ColdFusion servers! If you're not familiar, it is a scanner that looks for security vulnerabilities on your server. An emerging standard called Strict Transport Security is starting to gain some traction among web browsers. Google Chrome supports it and Firefox is working on it (currently supported in the noscript FF extension). Adobe released a security hotfix for a path traversal vulnerability in ColdFusion administrator (CVE-2010-2861, APSB10-18). On the Adobe security bulletin page it lists affected software versions: ColdFusion 8.0, 8.0.1, 9.0, 9.0.1 and earlier versions for Windows, Macintosh and UNIX. How do you protect your code from Cross Site Scripting (XSS) when your business requirements state that the user must be able to input HTML? This can be a difficult problem to solve and XSS is very difficult to filter against because there are hundreds of attack vectors. As promised I just published the slides for my Writing Secure CFML presentation at CFUnited 2010. The slides for my 2010 CFUnited presentation Locking Down ColdFusion are now available. The presentation is based on the ColDFusion 9 Lockdown Guide whitepaper that I wrote for Adobe. It covers various techniques to make your ColdFusion installation more secure. FireFox (3.6.7) released today fixed an interesting security vulnerability called Cross Domain Data Theft using CSS discovered by Google security researcher Chris Evans. I do a lot of work related to security in ColdFusion and I've been keeping a list of ideas and features that could make a future version of ColdFusion more secure. I will be presenting at the ColdFusion Meetup online user group this Thursday (June 17th) at Noon Eastern Time. The topic: Introduction to FuseGuard and Web Application Firewalls. As you know one of the first things you should do on a production ColdFusion server is disable robust exception information (this includes things like source code, and file path disclosures in error messages), in the ColdFusion Administrator. Is your ColdFusion Administrator Actually Public? Your scanner says our ColdFusion Administrator is publicly accessible, but I don't think that's true. I've just finished updating the HackMyCF.com ColdFusion security scanner to detect the BlaseDS Vulnerability APSB10-05 announced in February 2010. As you hopefully know, this vulnerability also effects ColdFusion 7-9, because it has BlaseDS installed by default. As you may have heard, Jason Dean and I are teaching a cf.Objective() pre-conference one-day hands on ColdFusion security training class. We are giving away a seat to the class, and today March 23rd is the last day to enter (you must enter by 5pm Eastern Time), you can enter once per day. I've been doing some security work in Windows 2008 recently for a client, one feature I've really come to like in IIS 7 is Request Filtering. You can configure Request Filtering at the server wide level, and then override or enhance the filtering at a site / application level. One of the best ways to really learn about something, is to roll up your sleeves, get your hands dirty. This is especially true for learning about security, it can be difficult to fully understand how attacks work by just reading about it. ColdFusion 9 Solr Vulnerability - Are you at Risk? Adobe just released a security bulletin APSB10-04 for ColdFusion 9. If you have the Solr Search Service running on a ColdFusion 9 server it binds the Solr Web Service to port 8983 on all IP addresses. Adobe has also released a Technote describing how to fix the issue. If you use the cflogin tag to manage authentication you should consider setting loginstorage="session" in your Application.cfc or Application.cfm file for better security. Just as SSL Certificates were starting to become really inexpensive, they figured out a way to start charging more money again. Here are the slides for my Writing Secure CFML presentation given to the New York City ColdFusion Users Group November 10th, 2009. Enjoy. I am happy to announce today the release of FuseGuard Web Application Firewall for ColdFusion! I will be speaking at the New York City ColdFusion Users Group meeting tonight at 6:30pm on Writing Secure CFML. We will discuss several web application vulnerabilities that ColdFusion developers need to be aware of, and how to prevent them from being exploited in your Web Applications. A good security practice is to require SSL for ColdFusion administrator access (an even better practice is to limit access to localhost). This should only take less than five minutes on either Apache or IIS. Back in August Adobe released a series of ColdFusion security Hotfixes in security bulletin APSB09-12. One of the vulnerabilities that was supposed to be fixed was a Cross Site Scripting vulnerability that I found and reported to Adobe, known as CVE-2009-1877. My company Foundeo Inc. released a new free web service today called HackMyCF that allows you to scan your ColdFusion server to detect the absence of recent ColdFusion security hotfixes as well as other security problems. When ColdFusion 8 added the ability to return data from remote functions formatted with JSON they also added some settings that allow you to put a prefix on the JSON string. I have a client using the standalone FCKEditor on his server (not the one in /CFIDE/ it is located at /FCKeditor/), but after installing the security hotfix for ColdFusion 8's builtin FCKeditor, the file manager for uploading and inserting images stopped working. It's no secret by now that if your web site sees credit card numbers (even if they are passed to a third party gateway) you need to comply with the PCI DSS standards. If you are using Railo you will want to make sure you have locked down the uri /railo-context/ - this is Railo's equivilent to ColdFusion's /CFIDE/ directory. It contains the Railo Administrator, as well as some other supporting files and mappings. There has been some confusion over the ColdFusion web server connector (wsconfig.jar) hotfix CVE-2009-1876 which is part of Adobe Security Bulletin APSB09-12. Whether or not this hotfix is required on IIS has been a question posed by many. Adobe posted several critical hotfixes for ColdFusion and JRun yesterday in Security Bulletin APSB09-12. I discovered one of the XSS vulnerabilities, and I will post details about it soon. In the mean time, please patch your servers. I've said it before, tradeoff's pop up in programming all the time. They are often difficult decisions, with no easy answer, and we often make the wrong decision. Adobe has just released a security hotfix for the FCKeditor vulnerability in Coldfusion 8. Also of Note, Adobe's Terry Ryan posted a blog entry today detailing How to report a ColdFusion Security Issue to Adobe. I've been meaning to post the slides the presentation I gave at cf. I've had a chance to look at the FCKeditor code a little bit in order to determine what the risks actually are of this vulnerability. There have been a few stories about a vulnerability in FCKeditor that is bundled with ColdFusion 8, first on SANS and now on The Register. The FCKeditor ColdFusion connector isn't enabled on all CF installations, I think if you installed a fresh 8.0. FireFox 3.5 was just released about a half hour ago. You can checkout all the new features for web developers here. For me, as someone that does a lot of security research one of the most interesting new features is the Origin http header that FireFox 3.5 now sends. Allowing someone to upload a file on to your web server is a common requirement, but also a very risky operation. So here are some tips to help make this process more secure. The accept attribute gives a terrible false sense of security. Secure your ColdFusion application against SQL injection attacks, and I have a few issues with the article. I'm excited to announce today the launch of Foundeo's latest product: the Foundeo Web Application Firewall for ColdFusion. The product can block or log malicious requests to your ColdFusion applications. If you haven't been using the cfqueryparam tag, chances are you had a baptism by fire this week. As you may have heard, lots of ColdFusion powered sites were targeted by hackers using SQL Injection this week. Spry recently had an embarrassing security breach, in which several email addresses and passwords were stolen. To start with it appears that the breach was made through some malware/spyware installed on an employee's office computer. Adobe has published a whitepaper called: ColdFusion 8 Product Security Briefing, which outlines the results of an independent security audit from Information Risk Management Plc. You may be surprised to learn that Microsoft Internet Explorer has supported a a security feature called HttpOnly cookies since IE 6 SP1. Firefox 2.0.0.5, which was released just the other day, now supports it. I want to thank everyone who attended my sessions at CFUnited this year. I was particularly amazed by the turnout for Building Secure CFML Applications. Here are the slides for the presentation. I'm proud to announce a Web Application Firewall for ColdFusion, a new product that I have been working on. This product detects malicious requests (such as SQL Injection, Cross Site Scripting, etc) and then logs, filters, or blocks the request. Christian Matthies has recently setup an aggregator for web application security related blogs called Planet Web Security. Highly recommended for staying on top of the latest web application security threats and exploits. With the addition of a dozen new type values for the cfparam tag in ColdFusion 7, it has become a handy tool for validation. I have a little trick for those of you who are using earlier versions of ColdFusion that don't support the new types for validation. PHP security guru Chris Shiflett has a great post about the dangers of Cross Domain Flash. If you have implemented a crossdomain.xml file you will want to read his post. If you have a crossdomain. This should be an eye opener to many. In September Mitre reported that web application vulnerabilities are claiming the top three spots on their CVE request list, beating out Buffer Overflows. Cross Site Scripting (21.5%)SQL Injection (14%)PHP includes (9.5%)Buffer overflows (7. SecGuru has posted a cheat sheet for Web Application Security. There is also an earlier version of the cheat sheet as well. This is a handy reference, but it is good to keep in mind that no book, or article about security is ever exaustive or conclusive. Ivan Ristic has posted a proposal on his blog called: Secure Browsing Mode [PDF]. A friend of mine, Matt Finn, was telling me about a security issue he realized recently. There is a good presentation on Google Video called How To Break Web Software - A look at security vulnerabilities in web software given by Mike Andrews to Google staff. Mike's book also happens to be called How to break web software. Steven Erat just pointed me to a technote from Macromedia Adobe called: Configuring ColdFusion MX 7 Server Security in the comments of my securing apache config article. Here are 20 things you can do to make your apache configuration more secure. Disclaimer: The thing about security is that there are no guarantees or absolutes. SANS has published a list of the top 20 internet security vulnerabilities of 2005. The list is not however cumulative, it features security vulnerabilities that have been the most prevalent within the past year and a half. It seams that someone recently hacked myspace.com, the ColdFusion powered community site with millions of users. Always, always set autocomplete="off" in the input tag. "But, my gut feel is that it would not be a good idea to fully expose the source for RDS as that may create potential security problems. Ivan Ristic, the author of Apache Security, and the mod_security Apache module, and Java Filter, is trying to create a spec called the Portable Web Application Firewall Rule Format. I tend to forget the syntax every time, but one of the first things I do when I setup an Apache web server is add/edit these two directive in my httpd. Oracle has released a critical patch update for several of its products, (database server, enterprise manager, application server, e-business suite, workflow, forms, reports, JInitiator, developer suite, and express server). Ivan has made two chapters from his book Apache Security available for download. He just released the chapter on secure php configuration, and the chapter on installation and configuration was previously made available. WatchFire has released a white paper on HTTP Request Smuggling - a new type of attack that targets multi-layer HTTP stacks (proxies, caches, firewalls). What is HTTP Request Smuggling? HTTP Request Smuggling (HRS) is a new hacking technique that targets HTTP devices. WARNING - just like its inability to protect against all forms of XSS attacks this solution DOES NOT protect you from all SQL Injection attacks. ColdFusion MX 7 has a new feature that lets you "lets you protect one or more variable scopes from cross site scripting (XSS) attacks". It can be turned on in the cfapplication tag using the scriptProtect attribute, or in the ColdFusion Administrator as a global setting. I found a site that has some good security tips for web developers. It mentions one type of attack that doesn't get much attention - called Cross Site Request Forgery (CSRF). Please do not go to this website! Via Loose Wire - Someone has registered the domain googkle.com, the site attempts to install spyware, viruses, etc. I Realized something when using Apache mod_rewrite for search engine safe url's, they also provide input type validation. I can use mod_rewrite to ensure that only integers are passed in my url in the id. For example, on my site macread I use url's like: http://macread. I read part of Real World Linux Security this weekend. It's a very detailed book that covers a wide range of security topics, from an author with lots of security experience.